The standing-room-only crowd at Heritage Auctions’ Platinum Night U.S. 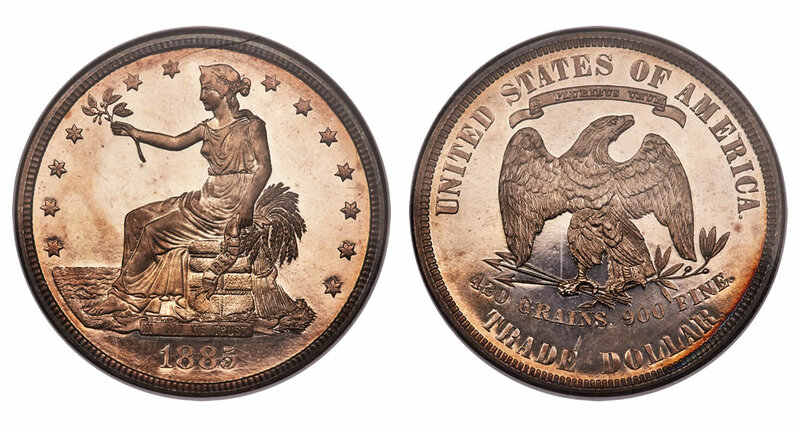 Coin Auction roared with laughter and applause after Hansen bested more than 30 bids to make hobby history. "The sale is fortuitous in that it comes at a time when 19th century Trade dollars were meant to improve commerce with China — a national goal we are still working on nearly 150 years later," said Greg Rohan, President of Heritage Auctions. "Owning an 1885 Trade dollar is a privilege reserved for only the most elite numismatists, and owning the finest-known specimen is to own an enduring symbol of numismatic and American history," Rohan said. 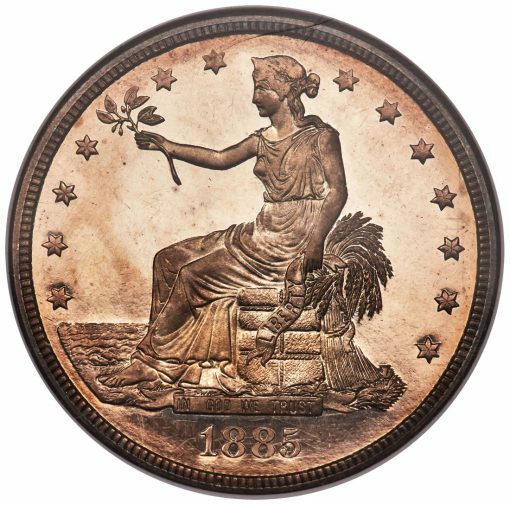 Initially graded PR66 by Numismatic Guaranty Corporation and then crossed over to PCGS PR65+ CAM by the Professional Coin Grading Service, the Trade dollar offered by Heritage carries an impressive pedigree, which includes highly respected collectors William Cutler Atwater, Louis Eliasberg … and now Dell Loy Hansen. 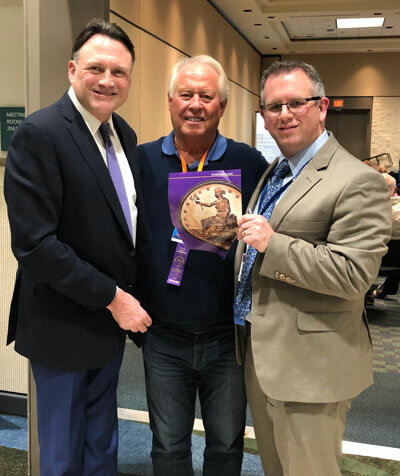 Making Numismatic History: Celebrating the $3.96 million sale of the finest-graded 1885 Trade dollar is (from left to right) Greg Rohan, President of Heritage Auctions, Dell Loy Hansen, the new owner of the finest known 1885 Trade dollar and John Brush, President of David Lawrence Rare Coins. 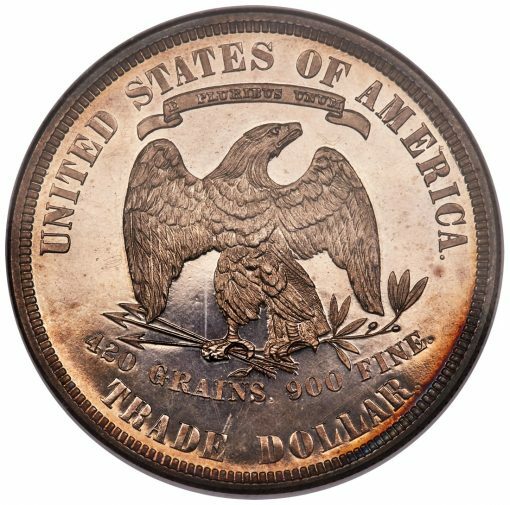 So rare is an 1885 Trade dollar that none of the great institutional collections at the Smithsonian, the American Numismatic Society, or the American Numismatic Association owns one of the five specimens. Information on the origin of the five pieces remains one of the greatest unsolved mysteries in numismatic history. Indications are that the coins were struck in the Philadelphia Mint, and the lack of documentation indicates they may have been struck clandestinely. The very first trade dollars were struck in 1873, and the majority of the coins were sent to China to compete against other nations’ large silver coins. The issues were not officially discontinued until 1887, so it is still possible that the five 1885 Trade dollar coins were produced for some legitimate purpose, such as inclusion in the proof sets of that year. "This is only the third time this specimen has been offered at auction and we, at Heritage, are simply delighted and honored to play a role in a new chapter of this great rarity," Rohan said.